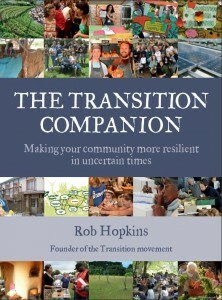 Here is another review of ‘The Transition Companion’, this time by Jeremy Williams at Make Wealth History. It takes a whole book to explore that question because the answer is diverse. There is no one way to transition your town or city beyond fossil fuels. Only tailor made local approaches are going to work, approaches that honour local history and tradition, and that respond to the specific needs of people and place. But in exploring what others are doing, in looking at what has worked, and what has failed and why, certain patterns emerge – good ideas to try and pitfalls to avoid. Those ideas are written up as ‘ingredients’ and tools for setting up and running a transition initiative, things to consider or to think through – how to live up to the claim of being inclusive; should you have an office or not; celebrating failures as well as successes; mini how-tos on fund raising and public speaking. Whether you’re starting out or well on already, there’s plenty here to learn from. In keeping with the ‘pattern language‘ inspiration of the book, it is divided into short numbered sections. Each has a one or two sentence summary at the start, and a ‘you may also enjoy’ box at the end. It makes the book easy to dip in and out of, browsing the bits you’re most interested in or are most relevant. The ‘companion’ title an apt one. If you’re new to the whole concept of Transition, The Transition Handbook has more detailed explanations of why a transition is necessary, and how the ideas were developed. If you’re familiar with the ideas and want to see how they are being worked out in practice, this is the one to go for.